SuperCollider is a platform for audio synthesis and algorithmic composition, used by musicians, artists, and researchers working with sound. It is free and open source software available for Windows, macOS, and Linux. scsynth, a real-time audio server, forms the core of the platform. It features 400+ unit generators (“UGens”) for analysis, synthesis, and processing. Its granularity allows the fluid combination of many known and unknown audio techniques, moving between additive and subtractive synthesis, FM, granular synthesis, FFT, and physical modeling. You can write your own UGens in C++, and users have already contributed several hundred more to the sc3-plugins repository. sclang, an interpreted programming language. It is focused on sound, but not limited to any specific domain. sclang controls scsynth via Open Sound Control. You can use it for algorithmic composition and sequencing, finding new sound synthesis methods, connecting your app to external hardware including MIDI controllers, network music, writing GUIs and visual displays, or for your daily programming experiments. It has a stock of user-contributed extensions called Quarks. scide is an editor for sclang with an integrated help system. SuperCollider was developed by James McCartney and originally released in 1996. In 2002, he generously released it as free software under the GNU General Public License. It is now maintained and developed by an active and enthusiastic community. This is the latest build of the development branch. These are the latest builds of the development branch. Development of SuperCollider happens on GitHub, and we are grateful to the community for contributing bugfixes and improvements. Before contributing, make sure to review our code of conduct. You can find information on getting started as a contributor, such as how to propose bugfixes and improvements, how to test your changes, and an overview of our development process, in our contributing guide. To help you get familiar with our contribution process, we have a list of good first issues of relatively limited scope. This is a great place to get started! You can also ask about good first issues on the mailing list or Slack. The community is very active and helpful, the center of activity. Please do drop by. 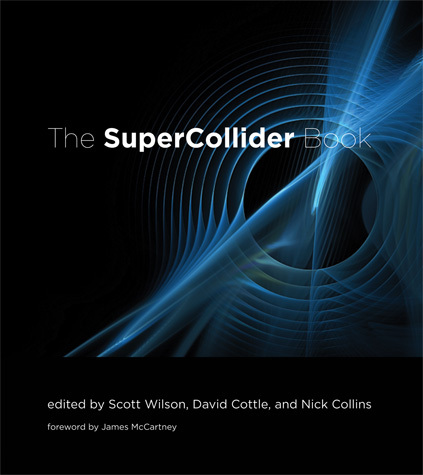 The SuperCollider Book is the essential reference to this powerful and flexible language, offering students and professionals a collection of tutorials, essays, and projects. With contributions from top academics, artists, and technologists that cover topics at levels from the introductory to the specialized, it is a valuable sourcebook both for beginners and for advanced users. Licensed under the GNU General Public License.